Taut Gold Standard Collagen Infusion Mask, age defying mas k is a facial mas k with premium collagen-enriched essence for all skin types. This treatment mas k is for those who desire firming, hydrating and brightening effect in 7-10 minutes. 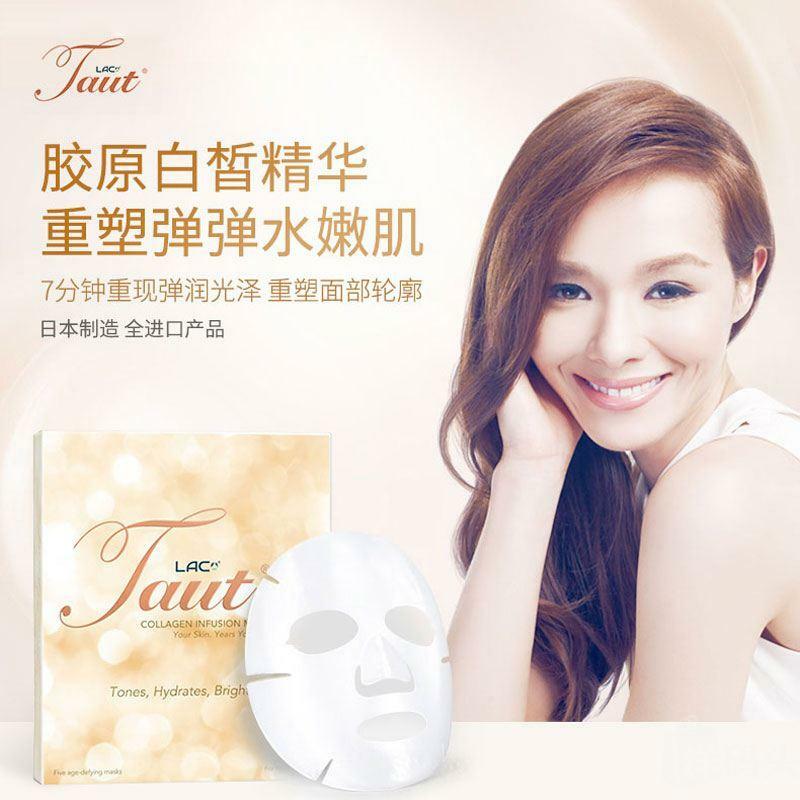 Ideal to be used with Taut Collagen drink to achieve fast & visible results. Hydrolyzed collagen which provides low molecular weight collagen allowing rapid penetration into our skin for firming. Sodium Hyaluronate, which is a polysaccharide that function as a tissue lubricant and exerts mechanical protection (moisture) to the skin. Squalene, which acts as a moisturizer and penetrates skin quickly. It blends well with other vitamins too. Tocopherol, the bioavailable form of vitamin E that exerts its benefits on skin including reducing the tendency of age-spots formation and reduce scars/marks on the skin. Promotes collagen level in the skin for firmness and elasticity. Deeply hydrates and nourishes skin to reveal a more moisturized, luminous. Instantly soothe away stress and tension signs, restoring skin glow. Repairs the skin of free radical damage, reducing rate of skin ageing and produces a whitening effect (due to skin clarity & glow). Please note that there is strictly no exchange or refund unless product is defective upon receipt. Requests for refunds must be lodged via email to livewell@gncmal.com.my within 7 days of receipt.